Oculus VR appears to be readying RiftCon, its very own convention dedicated to all things virtual reality. Oculus VR has been flogging its wares in a lot of different places, but now it appears that the company is preparing to whip up a show of its own. It filed a trademark application last week for "RiftCon," described as for "organizing exhibitions for cultural, educational, or entertainment purposes; organizing exhibitions in the fields of interactive entertainment, virtual reality, consumer electronics and video game entertainment industries for cultural or educational purposes; entertainment services, namely, arranging and conducting of competitions to encourage use and development of interactive entertainment, virtual reality, consumer electronics, and video game entertainment software and hardware." 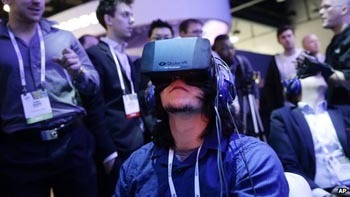 Oculus has appeared at CES, the Sundance Film Festival and IndieCade East this year alone, and is scheduled to attend GDC and SXSW Interactive in March. But a convention of its own would be a big step toward positioning itself among mainstream gamers as a unique and important piece of tech, rather than just another gimmick. Oculus VR declined to comment, but it seems clear that this is the next big step. The Oculus Rift headset made a big splash last month with a number of demos at CES, which left our own Devin Connor predicting that "it will be glorious" when the device is in full release.